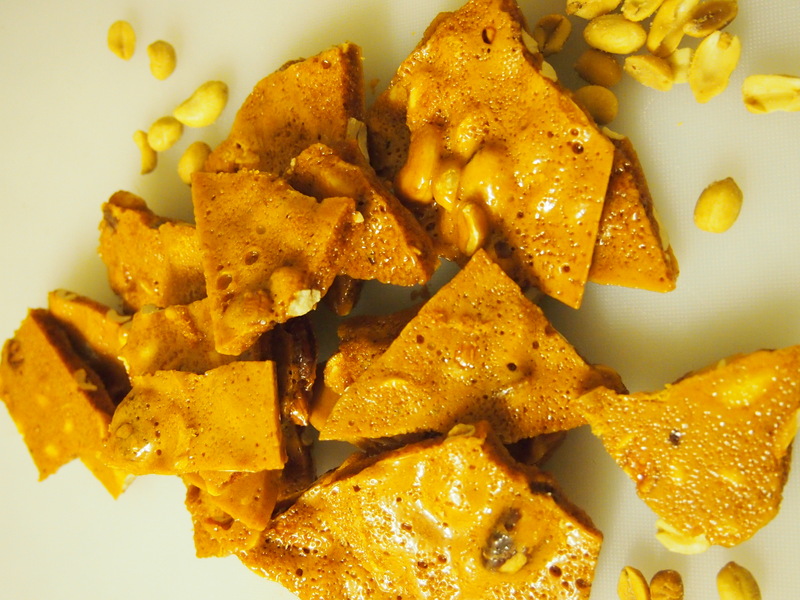 So, peanut brittle…little known facts. Difficulties aside, Christmas means peanut brittle so all challenges had to be overcome. Two tries later and a last minute dash to the hardware store for a candy thermometer by my son, and we had some really, really good peanut brittle. Butter a flat cookie sheet and place in a warm oven. Mix sugar and water in a saucepan and heat on medium high until sugar dissolves and you have a simple syrup (in place of the corn syrup typically used in the US). Keep heating while mixture begins to get caramel colored. Stir frequently and use a candy thermometer. When mixture gets to 300 F or 150 C, remove from heat and beat in nuts. Once thoroughly mixed in, add butter and baking soda and mix quickly. Finally, mix in the vanilla. Pull warm cookie sheet our of oven and pour peanut brittle on, spreading to make as thick or thin as you like. Allow to cool for several hours before shattering into pieces and enjoying! Quick tips: using a warm cookie sheet allows you to spread the brittle easier. Use a silicon spatula for stirring and spreading and it won’t stick. If you use salted nuts, omit the salt. If you use unsalted nuts, add the salt. Get all of the ingredients measured out before you start because you have to add them quickly at the end or the brittle will harden.